This pair of Cutting Pads was specially designed for use in the BIGkick, Big Shot and Vagabond machines. Constructed of high-quality polycarbonate plastic, these see-through Cutting Pads allow for easy die-cutting of Sizzix steel-rule dies (Bigz, Movers & Shapers, Originals and ScoreBoards) in the BIGkick, Big Shot and Vagabond machines. Sizzix Textured Impressions 3D EMBOSSING FOLDERS Collection A6 Size- You Choose! 5 out of 5 stars - Sizzix Textured Impressions 3D EMBOSSING FOLDERS Collection A6 Size- You Choose! 8 product ratings8 product ratings - Sizzix Textured Impressions 3D EMBOSSING FOLDERS Collection A6 Size- You Choose! Trending at $8.30eBay determines this price through a machine learned model of the product's sale prices within the last 90 days. 7 E-Guides by Silhouette School to help get you up and running faster (Link Located within Vinyl Idea Guide Card). (new users only). 1 Month Free to Silhouette Club. Bluetooth Connectivity. AutoBlade - Auto adjusts blade to match cut job material. Especially important with intricate cuts and delicate materials, the Spatula will precisely lift images from the Cricut cutting mat and prevent tearing and curling. Includes the following Cricut Tools: Scissors with protective blade cover; Tweezers; Weeder; Scraper; and Spatula. 4 pcs Siser Holographic Sheets (Assorted Colors). It is our machine that has the largest cutting space and is most versatile in the materials it can cut. It is covered when you close the lid. This blade will adjust itself based off the material it's cutting. Cricut Explore Air 2 machine. Cricut 12 in. StrongGrip cutting mat. LightGrip cutting mat. 4 Sheets - Cricut Foil Iron on HTV. 1 Roll Cricut Stencil Material. 3 Sheets Cricut transfer tape. 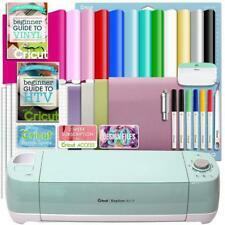 Cricut Design Space software & app. The Silhouette Sketch Pen Starter Kit contains 24 pens for sketching with your Silhouette machine. No pen holder adapter needed. Drop these rollerball pens into the machine where you normally put your blade, lock it in and off you go.sketching! Darice embossing folders - Easter Bunny embossing folder. Easter Bunny embossing folder creates a cute rabbit with eggs emboss perfect for Eastr handmade card or scrapbook page. Product Uses: die cutting,card making, scrapbooking, embossing, invitations, handmade cards,paper crafts. Trending at $5.05eBay determines this price through a machine learned model of the product's sale prices within the last 90 days. 12"x 10' roll of New Oracal Transfer Tape. Made specifically for OraCal 651 and 631 Adhesive Vinyl. • Thickness: 2.5 mil. • Adhesive: Clear, solvent-based, permanent adhesive. CHOOSE ANY COLOR OR COMBINATION OF COLORS! • Release Liner: number 84 custom silicone coated paper with special release characteristics that provide excellent weeding and release values.